Papua New Guinea PRIME Minister Peter O’Neill has officially launched the multi-billion kina Papua New Guinea electrification partnership project in Okapa yesterday, as he begins his trip which will also cover Usino Bundi in Madang. This is an outcome from Papua New Guinea’s hosting of APEC in 2018, the electrification partnership will connect 70 per cent of the nation’s population to power by the year 2030. 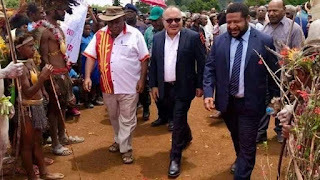 Mr O’Neill and his delegation arrived at Okapa Station, Eastern Highlands Province, on a two-day visit through the Eastern Highlands and Madang provinces. The Prime Minister was welcomed by the Member for Okapa Saki Hacky Soloma who thanked the Prime Minister for advancing development in the Eastern Highlands. “The eight members of Eastern Highlands Province pledge our support of our Prime Minister to complete this term of Parliament and continue to deliver development projects of our country,” he said. The same sentiments were echoed by Member for Kainantu and Minister for Mining, Johnson Ibo Tuke, speaking for the other district members in the province. The first stop on the trip is to officially launch the Papua New Guinea electrification partnership. The power expansion through rural and remote areas will be accompanied by a rollout of internet connectivity. Thank you for visiting this web page. We would like to hear from you, feel free to comment below.